Stung by all-round criticism, govt clarifies that Jio Institute will only get ‘Letter of Intent’ now. IoE tag only when they set-up in 3 years. 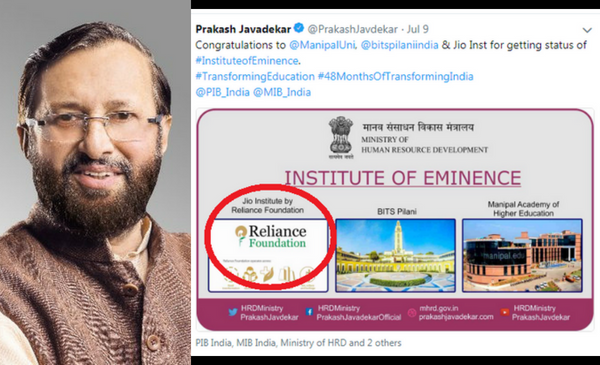 Prakash Javadekar, Minister of Human Resource Development, on Monday announced the names of six institutions which got the status of Institute of Eminence. The first ever list of Institute of Eminence included 3 public sector institutions – IIT Bombay, IISC Bangalore and IIT Delhi and 3 Private institutions – BITS Pilani, Manipal Academy of Higher Education and Jio Institute backed by Mukesh Ambani’s Reliance Foundation. The inclusion of Jio Institute in the list, a name that was never heard before, has raised questions about the selection process and eligibility criteria. BOOM looks at the UGC regulations and government announcements to understand what the newly introduced Institute of Eminence (IoE) is all about and answers key questions regarding the declaration of the 6 institutes, including Jio Institute as IoEs. What is an Institute of Eminence (IoE)? Institute of Eminence is a new category introduced by the Modi government in 2017 which will give 20 Indian educational institutions complete administrative and academic autonomy so that they develop into world class institutions. Javadekar said that complete autonomy would enable these institutions to grow more rapidly and are expected to be in the Top 500 of world ranking within 10 years and eventually in top 100. Accordingly, the UGC (Institutions of Eminence Deemed to be Universities) Regulations, 2017 was formulated. What are the salient features of an IoE? IoEs will have the autonomy to ‘admit foreign students up to 30% of admitted students; to recruit foreign faculty upto 25% of faculty strength; to offer online courses upto 20% of its programmes; to enter into academic collaboration with top 500 in the world ranking Institutions without permission of UGC; free to fix and charge fees from foreign students without restriction; flexibility of course structure in terms of number of credit hours and years to take a degree; complete flexibility in fixing of curriculum and syllabus, etc’, says a press release dated July 9, 2018. What are the eligibility criteria to become an IoE? For a government institute to be declared as an IoE it should be ranked in top 50 in their category under the latest National lnstitution Ranking Framework. Institutes in the top 500 in international rankings such as the Times Higher Education World University Rankings or QS or SJTU (Shanghai’s Jiao Tong University) can also apply for an IoE status, according to UGC (Declaration of Government Educational lnstitutions as lnstitutions of Eminence) Guidelines, 2017. For private institutes, in case of existing ones the sponsoring organization should have a net worth of at least Rs 3,000 crore. In the case of green field category, the sponsoring organization’s net worth should be at least Rs 5,000 crore. Moreover, the sponsoring organization should have identified the Chancellor, Vice Chancellor and a core team, a detailed fifteen year strategic vision plan and a five year rolling implementation. The sponsoring organization shall be a not-for profit society, a public trust or company under Companies Act 2013 and should have a track record of translating plans into real achievements in any field. Who is responsible for the selection of IoEs? 4) Shri Pritam Singh(Member)- former Director of IIM Lucknow. The government has not set a timeline for the selection of institutes eligible for an IoE tag. This could explain why only 6 insitutes have been declared as IoEs. The HRD Ministry had received around 114 applications. Will IoEs receive government funding? All the public institutions declared as ‘Institution of Eminence’ will get financial assistance up to Rs. 1000 Crore over the period of five years from the central government. Their private counterparts will not receive this funding though they can access research grants and government funds for specific studies or projects. How did Jio institute which has not yet been set up become an IoE? The Ministry and UGC have defended the decision claiming that Jio Institute was selected under the greenfield category. In a clarification tweeted by the Ministry, it cited the EEC’s 4 parameters for judging the 11 green field category applications it had received. However, the clarification does not have details such as the names of the Chancellor or Vice Chancellor, whose identification is one of the eligibility criteria for private institutions to be declared as an IoE. BOOM got in touch with a Reliance spokesperson who said that they are not in a position to comment on this yet. The Ministry also said that out of the 11 applications received under the green field category, only Jio Institute was eligible to become an IoE. Other green field entries include Indian Institute of Human Settlement, Bengaluru and Indian Institute of Public Health, Gandhinagar. EEC will repeat the selection process to select the remaining 14 IoEs. How did the government react to the criticism? After receiving sharp criticism, the Ministry’s clarification showed a deviation from Javadekar’s initial announcement. The clarification indicates that the Jio Institute’s IoE status is conditional. It says that Jio Institute will receive a Letter of Intent (LOI) and only within three years of set-up and commencement of academic operations, it will be declared as IoE. The conditional status was confirmed by R Subramanyam, Secretary, Higher Education in his statement to ANI. What were the reactions to the announcement of Jio Institute’s IoE status? No college, no building, no student, no teacher but #JioInstitute has no. 4 as per official government records. To be declared an Institute of Eminence, an institute has to pass many stringent tests and for passing that the institute has to exist! #JioInstitute qualified because Modi is prime employee of Motabhai? ?